‘All aboard the ghost train!’ Eines der gesuchtesten Indie-Kultalben der Achtziger erfährt nun erstmals auf CD seine Wiedererweckung mit Bounstracks. ‘The Werewolf of London’ war das Debütalbum des damals 19jährigen Barock-Psycho-Pop Musikers Paul Roland 1979. Original erschien die Vinylversion 1980 bei Ace Records zusammen mit den Midnight Rags, da Roland vermeiden wollte, dass dieses Album als Solowerk betrachtet würde. Eines ist klar, Paul Roland ist kein beschaulicher Songpoet. Von der Vincent-Price-Orgel, mit der dieses Album bei der Horror-Geschichte „Blades of Battenburg“ startet bis zum Abschluss mit dem Gänsehäutenden Titel „Sword and Sorcery“ kommt der Hörer nicht zur Ruhe! Paul Roland nimmt uns mit auf die Reise in seinem Geisterzug durch sein einzigartiges Reich, in dem sich CIA und KGB (bei „Brain Police“) bekämpfen, kleine Horrorfilme vor dem inneren Auge ablaufen („The Ghoul“ und „Werewolves of London“) und makabre Erzählungen auftauchen, die aus amerikanischen Horror Comics stammen könnten, die der junge Paul in seiner Kindheit gelesen hatte („The Puppet Master“ und „Dr. Strange“). Und natürlich gibt’s auch unheimliche Häuser, in denen junge Mädchen schutzlos ihrem Schicksal ausgeliefert sind („Madelaine“), hier übrigens mit dem Kollegen Robyn Hitchcock an der Leadgitarre. „Lon Chaney“ wiederum ist eine ausdrückliche Würdigung des gleichnamigen berühmten Stummfilm-Horror-Stars, und bei „Flying Ace“ lässt sich Paul Roland über einen Piloten des ersten Weltkriegs aus, der früher durch die Straßen von Rolands Heimatstadt zog. Der legendäre BBC Moderator John Peel spielte seine erste Single “Public Enemy“ (herrliche Gangster-Mär) andauernd, so dass eine limitierte Auflage von 1000 Stück innerhalb weniger Tage verkauft war. Paul Roland wurde so zu einem der Stars der gerade anwachsenden Londoner Goth-Szene. Sireena Records ist stolz darauf, dieses legendäre Album nach so viel Jahren erstmals auf CD veröffentlichen zu dürfen. Paul Roland steuerte 4 Bonustitel bei, die zum Teil unveröffentlicht sind. Und bitte „Werewolfes of London“ nicht mit dem gleichnamigen Titel von Warren Zevon verwechseln, Zevon fand den Roland-Titel übrigens klasse! 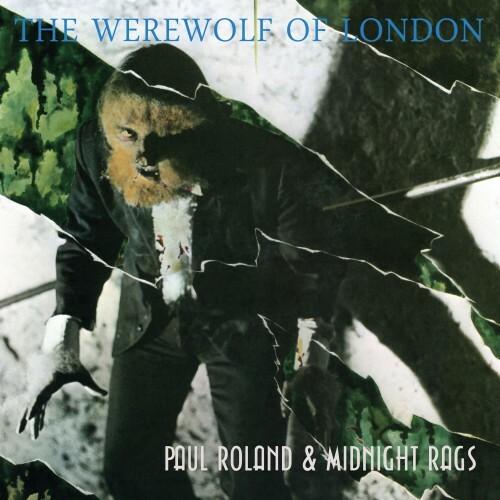 Hier noch eine Empfehlung von Paul Roland zum Album: "So pour yourself a glass of absinthe, light a big cigar and settle back for some spooky aural delights!" 'All aboard the ghost train!’ One of the most sought after cult indie albums of the 1980s will be released for the first time on CD by Sireena Records this autumn in a special edition featuring unreleased and re-touched tracks. Well, it should be clear from the opening bars of the mock gothic horror tale ‘Blades of Battenburg’ to the screaming feedback that closes ‘Sword and Sorcery’ (released in the ‘80s on Philip Boa’s Constrictor label as a single) that Roland is not an introspective soul searching songsmith! In between there are off-beat electro pop offerings such as ‘Brain Police’ (about the psychic war between the CIA and the KGB), miniature horror movies (‘The Ghoul’ and ‘Werewolves of London’), macabre tales inspired by American horror comics Paul had read as a child (‘The Puppet Master’ and ‘Dr Strange’, the former featuring Robyn Hitchcock and Knox of the Vibrators and the latter produced by Andy Ellison of John’s Children) and songs about lonely young girls living in empty mansions (‘Madelaine’, which features Robyn Hitchcock on backward lead guitar). Yes, horror is a recurring theme, but not the superficial or clichéd kind perpetuated by your average metal band. ‘Lon Chaney’, for example, is an affectionate portrait of the silent horror screen star who was born to parents who were both deaf and dumb and who later subjected his body to painful contortions to play the parts he became famous for and ‘Flying Ace’ is a touching sketch of a disfigured First World War pilot who Paul had seen on the streets of his hometown. Both feature acoustic guitar and violin which became integral to Paul’s sound in the late ‘80s. Plays of ‘Blades of Battenburg’ and also ‘Public Enemy’ (a catchy homage to 1930s gangster movies) on the influential John Peel show on BBC Radio 1 generated considerable interest as did regular spins at the London Bat Cave which became a centre for the emerging goth scene. The initial 1,000 copies were sold within the first few days and this led to a planned reissue of the album in a slightly different version by Armageddon Records (then home to The Soft Boys and Knox of The Vibrators). But after the albums were pressed a major label stepped in and bought both Paul’s contract and the unsold LPs which were destroyed. When Paul withdrew from the deal and locked the master tapes away for more than 30 years, it became a much sought after collector’s item fetching crazy prices on ebay and at record fairs. An internet campaign in 2006 finally persuaded him to issue a limited edition private pressing on CD for members of his PRAS fan club, but now Sireena is giving the album an official release with a revised track listing, two recently discovered alternate mixes and several previously unreleased tracks. Oh yes, and ‘Werewolves of London’ is NOT to be confused with the Warren Zevon song of the same name. Paul thought the title was just too good to be given to one song so he wrote his own, but Warren Zevon heard it during a radio interview and thought it was pretty darn funny, so that’s alright then. And we think you might like it too, along with its companions. So pour yourself a glass of absinthe, light a big cigar and settle back for some spooky aural delights.